Frans Balthazar Solvyns captured this American East Indiaman at anchor in Calcutta harbour in 1794. 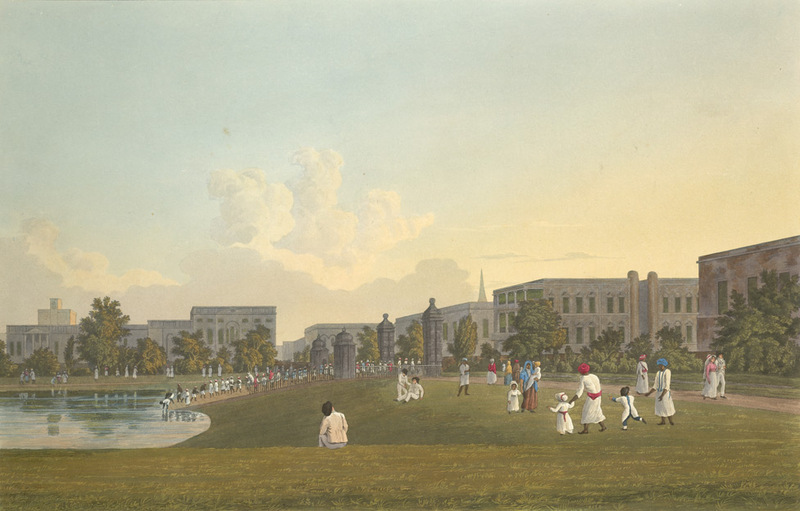 His painting offers a tantalizing glimpse of America’s forgotten India trade in its prime. Courtesy: Peabody Essex Museum. Ramdulal Dey, the millionaire Bengal merchant of late 18th and early 19th centuries, was the foremost name in the chronicle of Indo-American maritime trade. 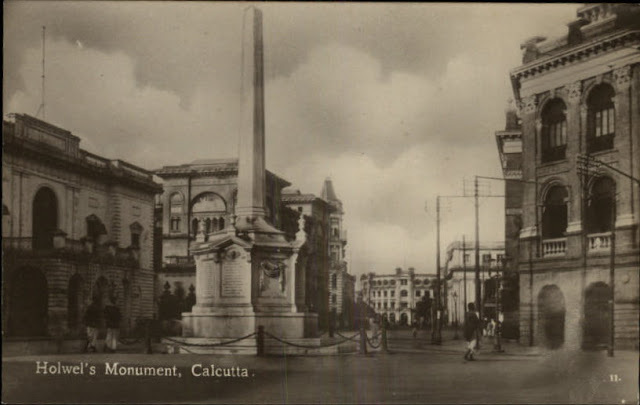 Trading in Calcutta was one of the very important mercantile experiences of America during her early phase of modern globalization. They reached Calcutta in 1775, on the ship Hydra, jointly owned by the Americans and the English. It was a critical time for the newly independent Americans. Being cut off from the West Indies and deprived of their traditional market, they were on the look for a new opportunity for trading. In the context of Napoleonic wars, the opportunity came their way to replace Europe’s East India trade. The wars kept all British ships busy in territorial defense. The European colonial powers were in constant conflict around Indian and Atlantic oceans. America, being a neutral nation, held a strategic position to exploit seaborne trading across troubled seas. American’s trade with British India began to grow extensively from 1790. In an average America sent 30 to 50 ships annually to Calcutta only. As it was estimated in 1806, within some years America had imported goods from Calcutta worth of at least three millions of dollars. 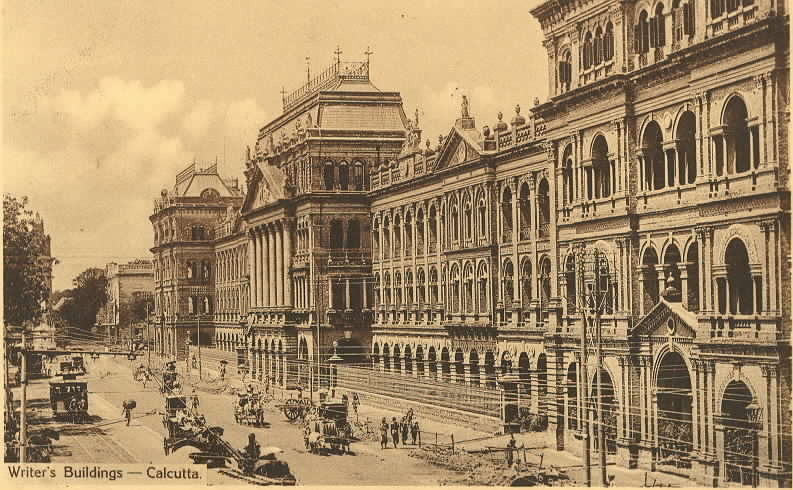 ‘Calcutta was the most active Indian port for their commerce. Americans in India never established a commercial house as they did in China. Nor did they use the European agency houses. Instead they made use of the services of the banians, or the Indian brokers. 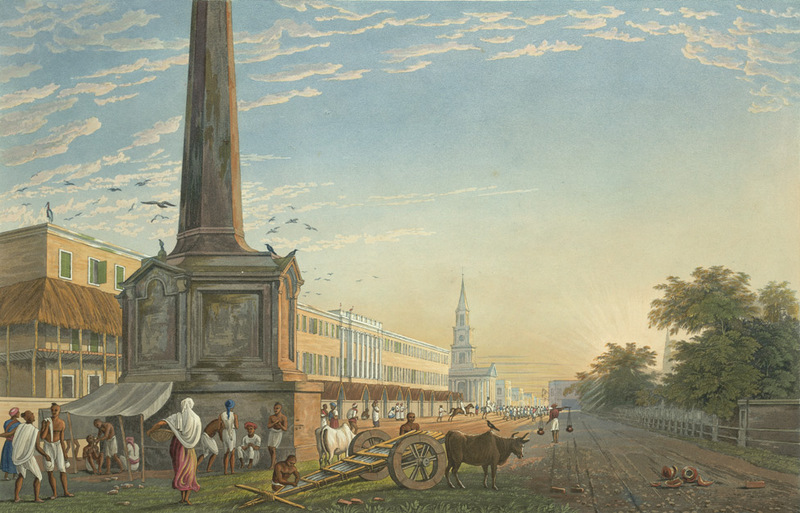 With East India Company background, the banians at Calcutta were already reputed professionals. A small number of banians took advantages of the situation and became specialists in the American trade. Ramdulal Dey, Asutosh Dey and Promathanath Dey, Rajindra Datta, Kalidas Datta, Rajkrishna and Radhakrishana Mitra, Ramchandra Banarjee, Kalisankar and Durgaprasad Ghose were some of the early banians who carried on big business in Calcutta with the Americans. Among them Ramdulal Dey was the first and most famous banian connected with the American trade. Ramdulal Dey, alias Dulal Sarkar was the eldest son of Balaram Sarkar, a poor villager of Rekjani, a hamlet near Dumdum. His only occupation was to impart Bengali writing skill to the children of the peasants backed by his rudimentary knowledge of Bengali and the gifted skill in calligraphic art he had. During the Mahratta invasion of 1751-52, Balaram with his expectant wife fled from his ancestral home for good. On their way, Ramdulal was born and began his journey of life with empty hands. Balaram, before he died, could give him nothing, not even rudiments of his own vernacular to his child. Ramdulal had already lost his mother. It was his maternal grandfather, Ramsundar Biswas who took the orphan boy to Calcutta where he lived ‘upon the fruits of beggary’, and his wife used to husk rice for the market until she could secure a stable job of a cook in the house of a wealthy merchant at Hatkhola. She brought in her grandson, Dulal, to stay with her. The master of the house, Madanmohan Dutta, Dewan of Export Warehouses, ‘the rival in wealth of Rajah Navokrishna’, did not mind adding Ramdulal to the long list of his dependents. Here Ramdulal managed to receive his first lessons from the pundit engaged for the sons of his master. He had only to buy erasable palm leaves for mastering alphabets, and plantain leaves for copying texts. His will and energy made him soon an excellent penman and a fast accountant. He also picked up by then some broken English. Madanmohan must have found in Ramdulal his qualities before offering him the job of Bill Sarkar on a salary of Rs 5/- a month. ‘Even out from this contemptible amount he contrived by rigid parsimony to save as much as a hundred rupees’, which he invested in a timber depot at Bagbazar with the purpose of helping his grandpa. Being much impressed with these admirable traits in the character of his young protégé, Madanmohan promoted Ramdulal to Ship Sarkar on pay of 10 rupees a month, ‘with lots of buxies, alternated of course by blows from ship captains, mates and crew.’ In all weathers, he was to go out into the mouth of the river at Diamond Harbour to superintendent the loading and unloading and discharge of cargo. After Khejuri Diamond Harbour was the place of anchorage for foreign vessels. In one of his trips he chanced to see a foundering vessel with full cargo close to the mouth of the Hooghly. Out of habit Ramdulal assess the nature of the wreck, cost of recovery and its worth. After a short while, Ramdulal was sent to attend an auction at Tulloh and Company for certain items to buy. Sadly, all those items were sold out before Ramdulal stepped in. Right that moment, the auctioneer was lustily crying up a wreck – an item out of their next lot. The wreck was no other than the one Ramdulal had recently witnessed. He was tempted to bid with his master’s money. His bid, perhaps the only bid, was accepted. Ramdulal bought the wreck paying fourteen thousand rupees out of his master’s money. Before he left the place, an English gentleman rushed to him insisting on reselling the ship to him. After a long-drawn haggling the Englishman stumped out handsomely and got the sale transferred in his favour. Back to his master, Ramdulal narrated the whole sequence before he humbly handed over to him the entire resale amount of nearly a lakh of rupees. His master, one of the progenitors of the Nimtala Duttas, had a princely soul. He blessed the boy – so unlike the world, so Roman in his honesty, and said, “Ramdoolal, the money is yours … you sowed the seed and you shall reap the harvest.” It was a treasure to a sarkar of 10 rupees a month. The windfall gift made up the working capital for his business venture that made him exceedingly rich and one of the richest in Calcutta during the lifetime of Madan Dutta. Ramdulal, however, never missed the occasion of receiving from his master his ten-rupee stipend and his blessings on pay days. In no time Ramdulal made a fortune by careful investment and good luck. During growth of consignment trade and agency houses, he was attached to Fairly Fergusson & Company as their banian agent. At the same time he worked independently for other traders, equipped with his outstanding negotiation skills, market intelligence, and his all-round support service, including, establishing local market connections, organizing dadny merchants, market promotion, and financial assistance as well. He was on great demand. His cooperation was also sought by all British agency houses. Ramdulal partnered with the American traders rather than the European companies or English private merchants. Apart maritime trade, Ramdulal had active interest in stocks and shares, and real estates. The genius of Ramdulal, according to his biographer, could transform dross into gold. However, he owed his earthly prosperity mostly to the American merchants whom he served as their local agent, and also invested his own capital with them. American merchants used his credit in their coasting trade in the Bay of Bengal region and shared profit with Ramdulal. From 1790 American trade with British India grew fast. Mostly the merchant houses of Boston, Salem, Beverly, Philadelphia, Providence, Marblehead, Yankee and New York sent their ships regularly to buy Bengal goods. Every house had its own banians stationed in Calcutta. 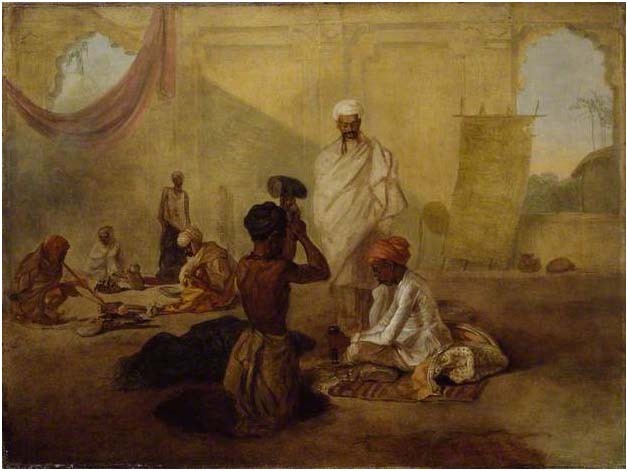 The Americans carried on the bulk of their trade through the Indian brokers. It was not simply because of economic reasons they did it, but for the strategic advantage of having the highly competent and experienced Calcutta banians by their side. The extent of Ramdual Dey’s American connection may be guessed from the array of merchants of whom he was the sole agent in Bengal. The list found from the books of the period immediately following his death. Mackie and coleridge, H.Lee, O. Godwin, Theuring and Perkins. Messrs. Lennox & sons, G.S. Higginson, Messrs. C & D. Skinner, Messrs.
Singleton & Mezick, S. Austin Junior, W.C. Appleton, E.B. Crocker, E.
Davies, J.J. Dixwell, W.A. Brown, A. Baker junior, G. Brown. T.C. Bacon, M.
The Hon’ble E.S. Rant, J.H. Telcombe. One of the American merchants fondly dedicated a vessel to ‘Ram Dolloll’ and named after him. 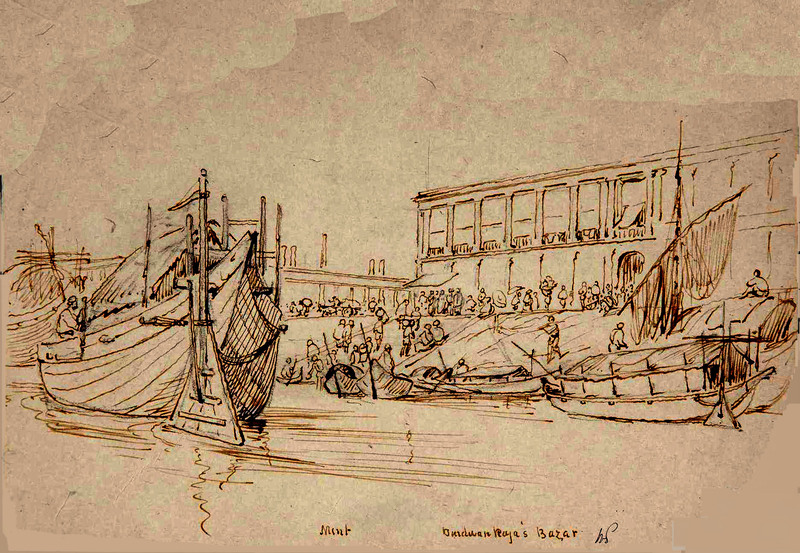 The vessel sailed carrying Ramdulal’s consignment to Calcutta thrice during his lifetime. Among the ships he owned, Kamala, and Vimala were named after his two daughters, and the ship ‘David Clerk’ was named after one his American business partners and a personal friend. The illustrious shipping magnet may serve as a striking example of ‘vertical mobility’ from poverty to wealth. Like two contemporaries, Akrur Dutta, and Krishnakanta Nandy (1720-95), Ramdulal rose to eminence from humble and obscure origins. Ramdulal Dey, the millionaire of the early 19th century, left estates worth of Rs 33,01,424 of which the Calcutta and suburban properties accounted for Rs 6,17,750, yielding an annual rent of Rs 25,314 (1825-26). By contrast the rural properties, all close to Calcutta, were worth only Rs 58,5000. He also left behind sundry promissory notes of the Hon’ble Company, shares in various insurance companies, sundry bonds mainly from Europeans, sundry bills including China supercargoes bill, notes from Rustomji Turner & Company, Davidson & Company, Palmer & Company, etc; ship David Clerk, shares in Sauger Island Society; and balances due from different companies. When one of the two sons of Ramdulal Dey died in 1854 his estates in Calcutta were worth Rs Rs 3,62,862 and the value of his zamindari properties was more than Rs 2,00,000. The proportion of zamindari properties to urban real estate demonstrated a substantial increase in one generation. Ramdulal had a noble heart and a humanitarian mindset. His charity was proverbial. He liberally donated for the cause of education and social welfare unquestioningly. He was a benefactor to the greatest educational institution of early colonial Calcutta, the Hindu College. Ramdulal was ready to extend help to suffering humanity anywhere; He had sent donations to the flood and famine victims in Bakhargunge, Madras, and as far as in Ireland. Ramdulal established ‘Atithisala’ an asylum for the destitute in Belgachia. At Beneras, he erected 13 Shiva temples. For sanctification of the temples alone Ramdulal spent around Rs 2,22,000. Besides, public charity, Ramdulal in private helped the poor and needy in many ways. He kept aside Rs 70 a day for the relief of distressed persons. He employed three physicians for visiting the poor patients to administer medicines and provide medical comforts at his expense. Ramdulal was a pious man. In spite of being fabulously wealthy he lived a simple life. The only regret he had, that his ambition for ‘Gostopati’ or the community leader of the Kayastha samaj remained unfulfilled. Ramdulal and his adversary, Raja Nabakrishna, were engaged in constant wrangling, backed up by their respective bands of supporters, বাবুর দল (Babur Dawl) and রাজার দল (Rajaar Dawl), where bards, jesters, and common citizens took part. The power struggle between the leaders also encouraged local talents to compose street music, street plays, cartoons etc. contributing to urban folk art and literature of lasting entertainment value and historical significance. Ramdulal breathed his last on April 1, 1825. His two sons, Asutosh, and Pramathanath, famously known as ‘Chhatu Babu‘, and ‘Latu Babu‘, respectively, performed the ‘Sradh’ ceremony of their father with unprecedented grandeur spending nearly five lakhs of Rupees. Asutosh alias Chhatu Babu, himself a musician, was one of the leading connoisseurs and patrons of classical music. His nach ghar was famed for the performance of the celebrated musicians and dancers of the country. The family maintains the cultural tradition till now. Because of their social graces, Asutosh and Pramathanath, noted for their largesse, were called as the ‘Babus of Bengal’. The epithet highlights their refined taste, affluence and extravagance. The two brothers kept up the social and cultural status to a large extent, but not the level of prosperity Ramdulal had passed on to them. The vast wealth of Ramdulal Dey was rapidly dwindled down due to many a reason. With the failure of Union Bank in 1848, the condition of Banians declined in all respect, and Deys were no exception. Their unfortunate commercial speculations and land investments were among the other reasons, besides the extravagance of his successors who frenziedly pursued their fads and hobbies as well as their noble craze for the performing arts. The house of Ramdulal Dey and his sons, delinked with its eventful past, remains a glorious centre of patronage of classical music and stage art in Bengal. Peabody Museum, Salem and Essex Institute’, Bombay 1990. English East India Company, 1757-1833,’ Studies in History, 1994, vol. 10, No. 1. Century’, Calcutta Historical Journal, XI: 1-2 (1986-87). +Ghosh, Grish. 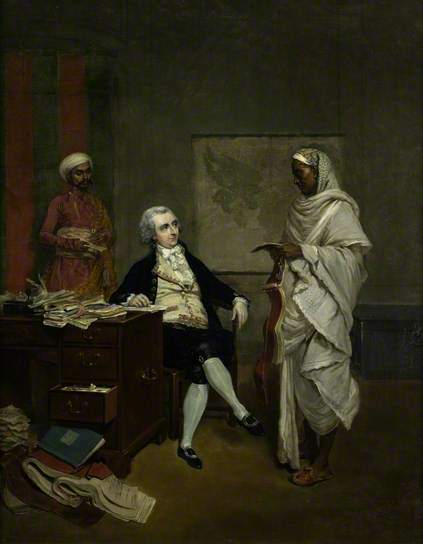 C., Ramdulal Dey: The Bengali Millionaire, Calcutta, 1868. Bangladesh, Golden Jubilee Volume (1956-2005), 2005. * Used extensively in this write up. 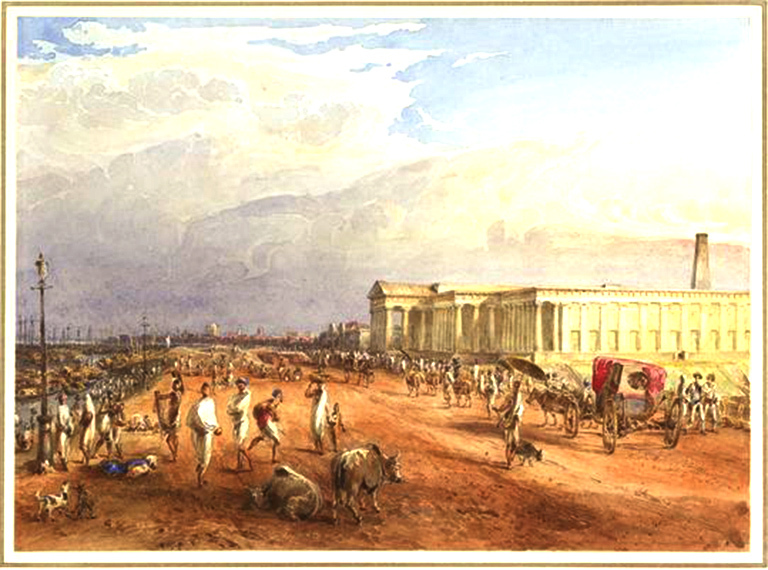 Dwarkanath revisited England in March 1845 with intention to secure permission of the Court of Directors of the East India Company to start construction of railroad from Calcutta to the coalfields above Burdwan. On April 14 he arranged to register a company, named ‘Calcutta and Ganges Grand Junction Railway Company’, with the objectives of making and maintaining a line from Calcutta to Rajmahal. Afterwards, on the suggestions of several parties familiar with the location in India, it was considered advisable to extend the line to some point on the Ganges further up towards the north-west, and decided on extending the line to Patna. Incorporating this addition to the former project Dwarkanath registered his company on the 23d of April, 1845 with a new name ‘Great Western of Bengal Railway Company.’ Dwarkanath “consented to act as trustee to the company in India, and his firm,Carr Tagore and Co., created in 1834, was appointed as the agents of the new company in Calcutta. 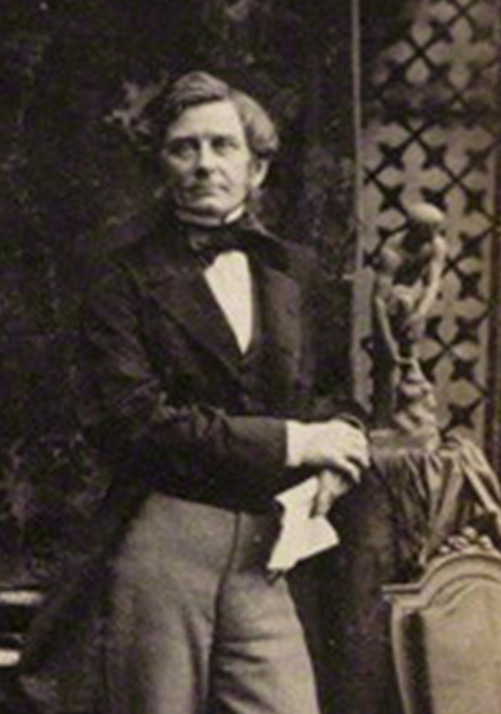 Dwarkanath tried his best to make a deal with the East India Railway Company, lately incorporated in England under the leadership of Rowland McDonald Stephenson, but never succeeded. 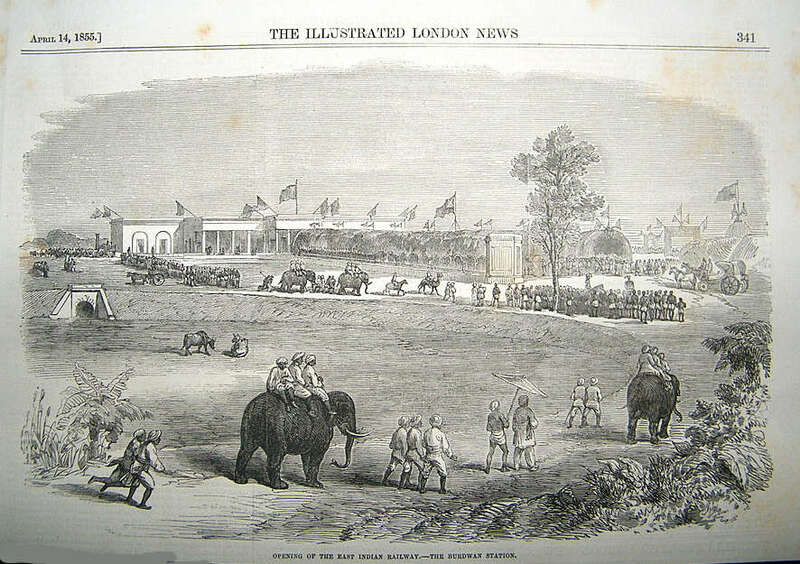 Interestingly, ‘Tagore was the man Stephenson came into contact with’ on his arrival in Calcutta in 1843. 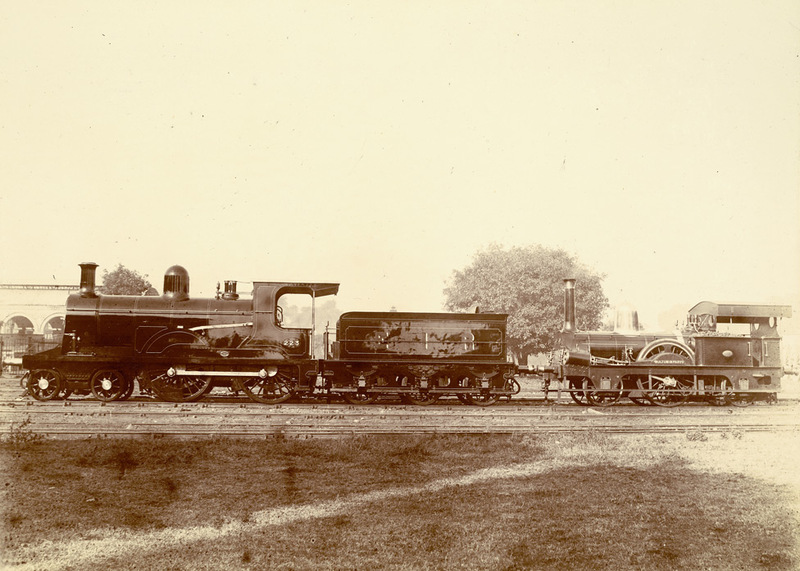 They had common interests and ‘both dreamed big.’ Stephenson in 1844 wrote a smart persuasive article on the prospect of railways in The Englishman, a paper that Tagore owned that time. 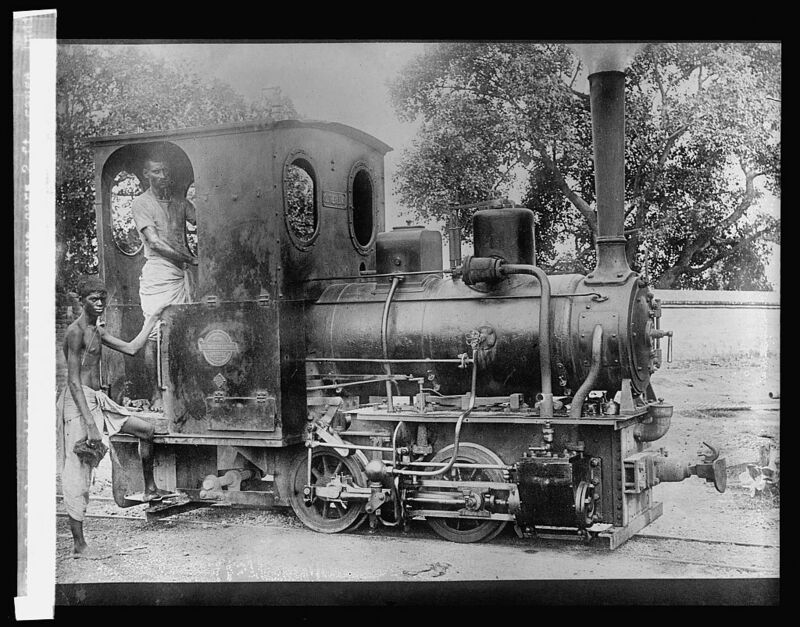 Dwarkanath’s primary motive was to secure permission to initiate construction of the line by proposing to raise one-third of the capital required for a railway from Calcutta northwest to the coalfields above Burdwan. He faced there greatest opposition from Stephenson, the Chief of the East Indian Railway Company. Stephenson wanted the line to begin from a point 20 miles above Calcutta, where the line would cross the river Hughli. This line would go straight onto Benares, and subsequent later lines would develop towards Delhi and Agra. 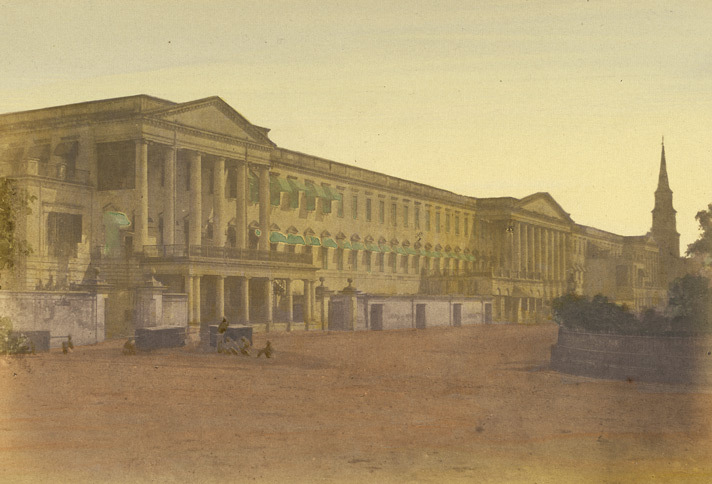 The Court of Directors of East India Company preferred to guard the interest of the British company, and had reservations ‘to permit a company under native management – to construct such an important railway line’. The Court sanctioned the circuitous route along the Ganga as Stephenson proposed. Within few months, Dwarkanath Tagore died ‘at the peak of his fortune’ luckless, on the evening of Saturday August 1, 1846. With him died the prospect of his railway enterprise. The Great Western of Bengal Railway Company met for the last time on March 20, 1847 and approved dissolution of the company. Subsequently on the 15th of April 1847, a proposal was initiated for amalgamation between ‘East Indian Railway Company’ and Dwarkanth’s ‘Great Western of Bengal Railway Company’. Toward the end of that year the two companies merged into a new company under the banner of ‘East Indian Railway’ (EIR) with Rowland Stephenson as its founder MD. This sanction may be reckoned as a belated tribute to the departed soul who breathed his last with dream unfulfilled. 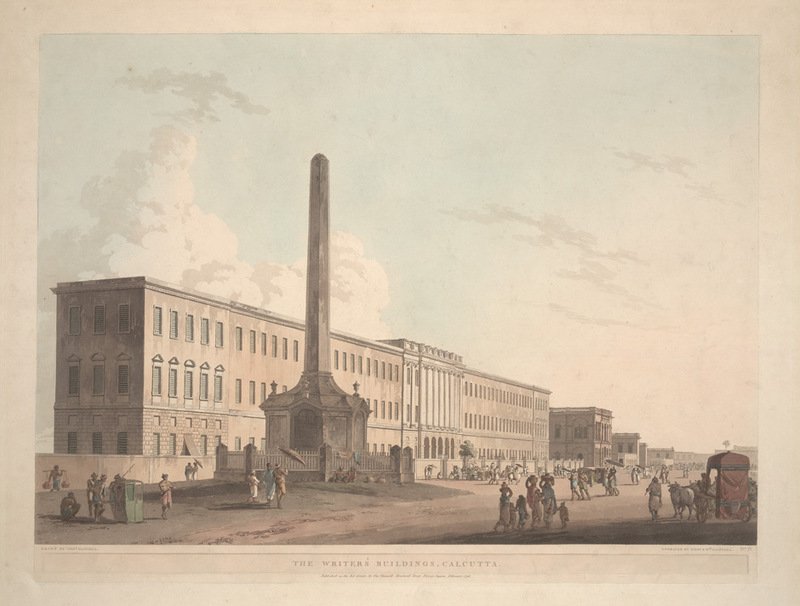 By 1756 Calcutta had reached such a stage of industrial progress, that its trade is stated to have exceeded one million sterling yearly, and that some fifty vessels or more annually visited its port. To conduct business with Indian producers it became vital for the Company to have interpreters, brokers and other native agencies. The brokers, like the Setts and Basaks, were weavers by caste. 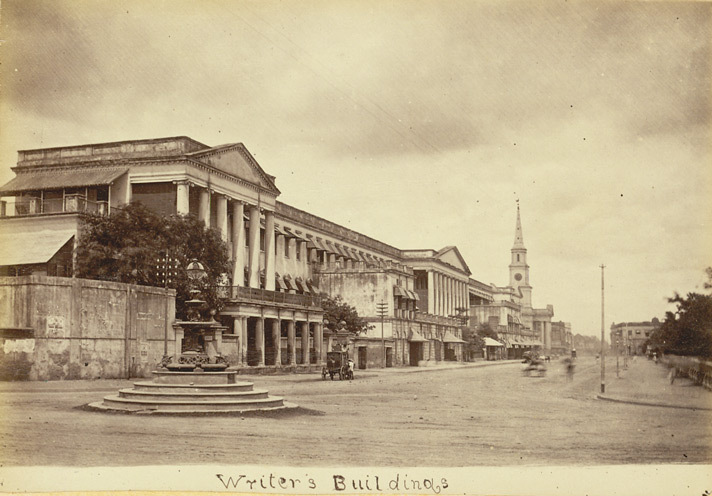 The Setts controlled the broker’s office in Calcutta until the end of the dandi system in 1753. By the beginning of the 19th century they had become Shroffs. The shroffs were essentially money-exchangers whose main business was to test the purity of coins and exchange coins. They also exchanged bullion for currencies, and vice-versa. In wider sense, the shroffs, or saraffs, were moneylenders and bankers, who accepted deposits and transferred funds from one place to another by means of hundis, that included bills of exchange and promissory notes. The banking house of Jagat Seths played the most significant role in Bengal’s monetary economy in pre-colonial to early-colonial period. Jagat Seth, besides the enormous assets accumulated in his house, had enough control over the mint at Murshidabad to make use of its resources for meeting the demands of the credit-hungry European Companies.Their control over the urban money market in Bengal was so profound that no money merchant or bullion dealer dared offer a higher price than Seths did. The grand success of the house of Jagat Seths was largely because of the business climate sustained in that time in which money-changing and banking activities flourished vigorously, and naturally produced numerous sarrafs and bankers of lesser fame. Sarrafs dealing in rupee coin generally operated at urban commercial centres, where various types of rupee coins came for circulation and were exchanged with one another. In Bengal, however, low-value exchanges were dominated by the cowrie currency, and there was hardly any copper coin in circulation in the 17th-18th centuries. Copper Mint began operation in Calcutta in April 1865, and it provided all copper and bronze coins for India from 1889 until 1923. It is understood that there were many wealthy sarrafs qua sarrafs operated in urban Bengal who dealt in rupees and sometimes in gold coins. 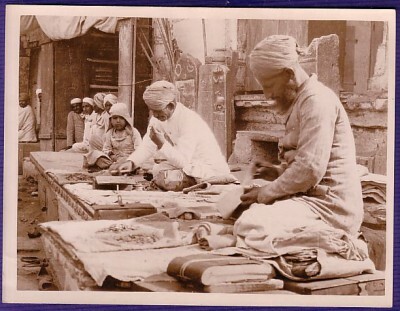 But there were a section of sarrafs operated in the rural markets – in haats and bazaars. They were called potdars – a term referred to in Chandimangal, the Bengali poetic work written in the second half of the 16th century. 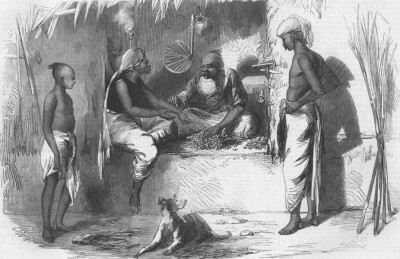 Potdars, as the book defined, were professionals engaged in exchanging gold, silver coin, and cowrie. More substantial cowrie dealing sarrafs got their stocks from domestic merchants who used to sell goods to cowrie-importing traders. Agents of big merchants and European companies needed cowries for procurement of goods, and they managed to receive these shells from the saraffs. There are another class of cowrie-dealing sarrafs, who operated at the lower-end of money-changing business and dealt with small rural vendors. In the early part of the day, the vendors took cowrie from them in exchange, and in the afternoon, bring back their cowrie and go away with the rupees. In the International sphere, a commodity currency that could not be clipped or fabricated, serverd at least partly, as a medium of exchange. In West Africa there was widespread circulation of cowrie. 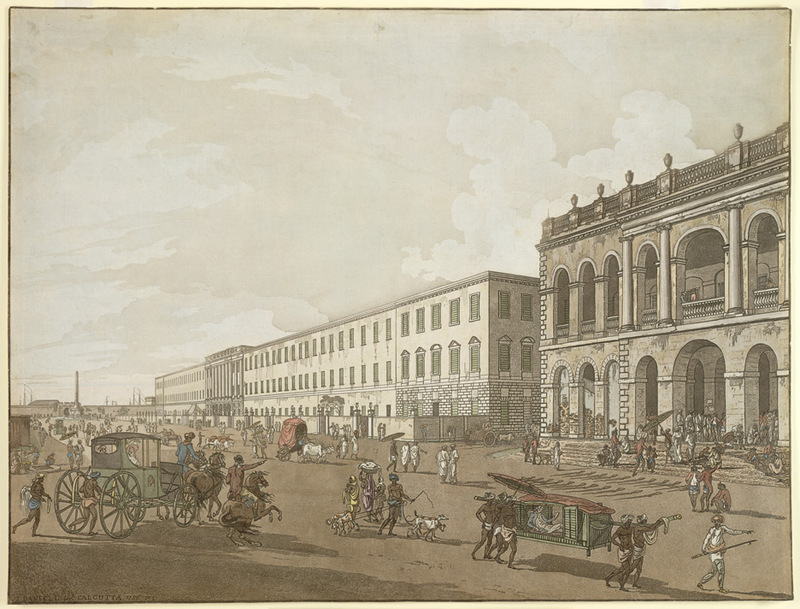 In some important European cities, like London, Lisben, Humbourgh, Amsterdam developed strong cowrie markets in the 17th and 18th centuries, and their chief supplier was Dutch East India Company. Overtime, the Dutch wrested control of the European cowrie trade from the Portuguese. Before the Mughals, cowries were exchanged with silver coins of the Afgan era. Mughals were not in mood to disturb the tradition of cowrie usage. 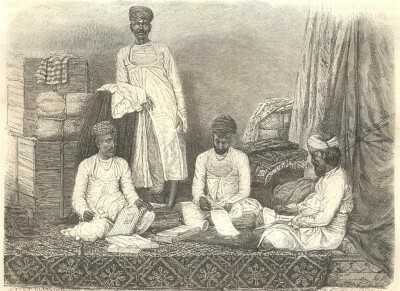 The picture featured above: John Mowbray, Calcutta merchant, seated at a desk piled with account books, attended by a banian or money agent and messenger. Oil on canvas by Thomas Hickey. Originally published/produced in c.1790. 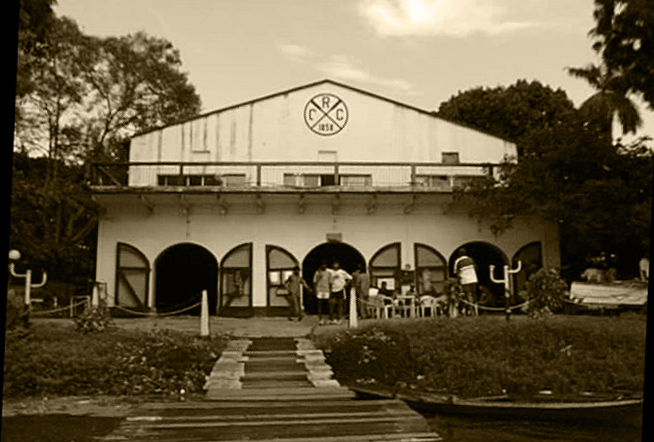 The Calcutta Rowing Club, probably the oldest club in the East, was founded by a small number of enthusiastic oarsmen in 1858. The first boat house with a thatched roof was on the bank of the Hooghly near Chandpal Ghat. This boat house was built in 1860 and lasted until 1864 when a disastrous cyclone swept it away-boats and all. during which the boat house and the boats, together with the minute books, and records disappeared. The only things preserved, were the Accounts of 1858-59 signed by John Cowle, as the Honorary Secretary and Treasurer, and he goes down in history as the first officer on record.The successor to this boat-house was built near Fort Point in 1865,. Upto this time, all the boats had fixed seats, but, about 1872, one of the members of the Club brought back with him from England a sculling boat fitted with a sliding seat. The owner, one Charles Newman, had for some time been propounding his theories regarding this type of seat and he might lay some claim to having been its inventor. 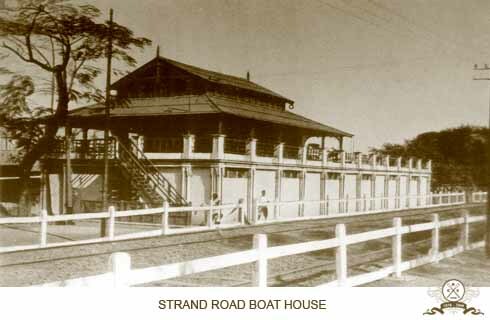 In 1888, the Club had to abandon its boat-house at Fort Point as the land moved to the new boat-house on Strand Road itself opposite to Eden Gardens. Rowing took place there during succeeding years, but, became progressively more difficult owing to the increase in the number of steam ferry boats and tugs. Many instances during this period are on record of boats being swamped and their crews having to struggle for their lives, against the strong under-currents of the river and regular rowing on the Hooghly was finally abandoned. Various alternative sites were tried, including Tolly’s Nullah and even the long tank in Eden Gardens which has long since been filled-in. In 1897, however, the Port Commissioners came to the rescue and offered a course on the Dock Basin at Kidderpore which is now occupied by the Coal Dock. 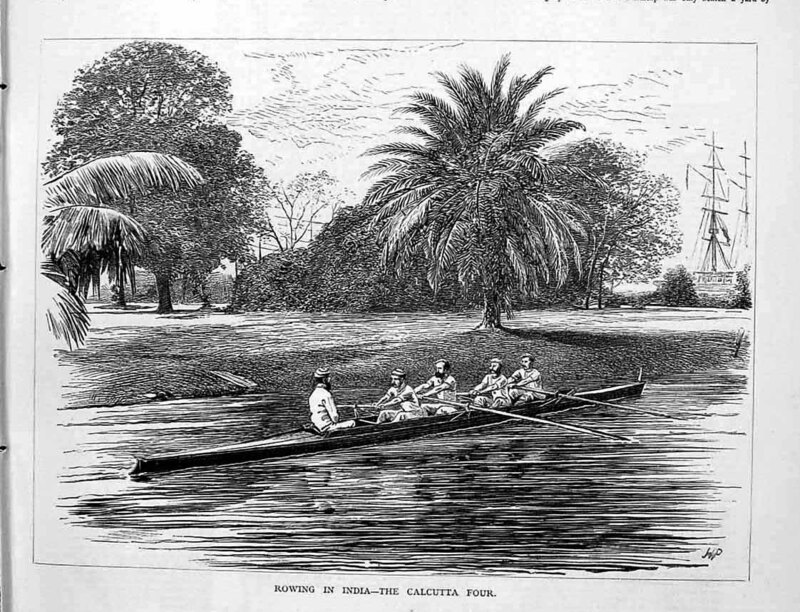 The pen & ink drawing,” Rowing in India -The Calcutta Four” was published in Illustrated Sports and Dramatic News, April 21, 1877.